Planning Solutions have been managing CONKERS, an environmentally themed visitor attraction, on behalf of The National Forest Charitable Trust, since 2001. The original CONKERS brand and product offer has traditionally appealed most to families with young children and there was a need to identify a strategy that would also have strong appeal to the teenage, adult and corporate markets as well. Planning Solutions researched a variety of product development opportunities and concluded that a High & Low Aerial Adventure Course would provide the exciting experience necessary to attract these new audiences, generate additional income and provide a positive return on investment. The new product was also sufficiently different to the traditional CONKERS’ offer that, it was felt it could be charged for as a separate ‘add on adventure’ in addition to the standard day visit ticket price. The National Forest Charitable extended Planning Solutions management contract to cover the operational management and marketing of the ropes course. Planning Solutions researched suitable companies to build the £250,000 course and to train the staff. The course opened in July 2015. The launch of this new product was an immediate success – with the Low ropes course attracting CONKERS’ traditional younger children and the High Ropes adrenalin experience including a climbing wall, zip wire and power fan descender, exciting both teenage and adult visitors alike. 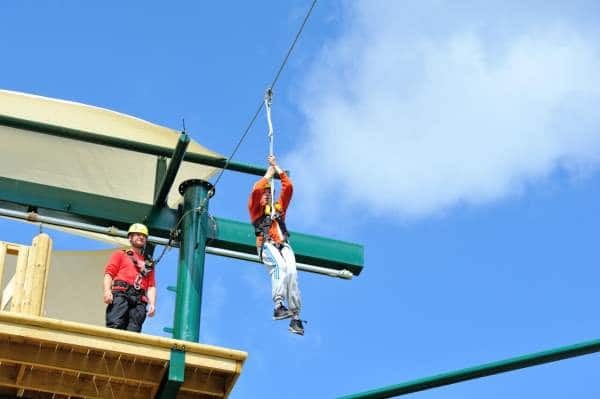 Click here to find out more about the High & Low Ropes Aerial Adventure.